Hundreds of whales died overnight on a New Zealand beach due to the largest mass stranding in decades. The Department of Conservation (DOC) found 416 pilot whales had beached themselves at Farewell Spit in Golden Bay at the top of the South Island. In fact, more than 70 per cent perished before sunrise on February 10. Another pod of more than 200 whales stranded on February 11. Hundreds of rescuers managed to save around 400 pilot whales on the South Island beach over the weekend. According to Peter Wiles, one of the volunteers who reached Farewell Spit to save the remaining whales, the white bellies of whale corpses were lined up on the sand. “It is one of the saddest things I have seen, that many sentient creatures just wasted on the beach,” he said. Golden Bay is conducive to stranding because its shallow muddy waters confuse whales’ sonar, making it difficult for them to swim out once they enter. On Friday morning, the locals cancelled all their commitments to help the DOC staff in saving the whales lying on the remote beach. The strandings could be due to a combination of factors, including old age, injury and sickness. Navigational errors are also common among whales, especially when chasing food or avoiding predators such as orcas. A recent report revealed that use of sonar in the oceans by US navy can be devastating to whales and other marine animals that rely mainly on hearing to carry out daily activities, including communication. According to Project Jonah, a whale rescue group, New Zealand has one of the highest rates of whale strandings in the world, with an average of about 300 whales and dolphins beaching themselves on Kiwi shores every year. The authorities have started cutting holes in 300 whale carcasses on Monday (February 13), to avoid the dead animals from exploding as they decompose on Golden Bay. This would help release internal gases that build up pressure. It takes several months for the bodies to decompose and turn into skeletons. 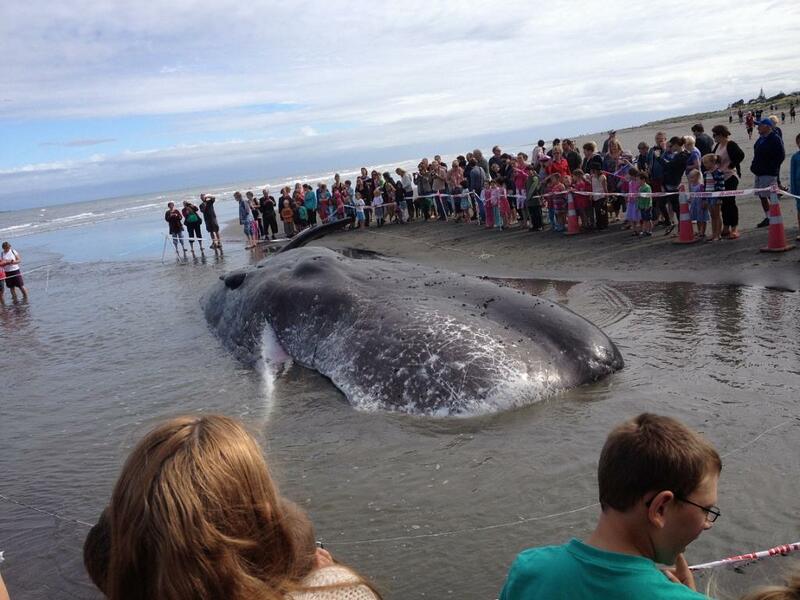 How frequent are the whale stranding incidents in New Zealand? According to DOC records, more than 5,000 whales and dolphins have beached themselves on New Zealand shores since 1840, but the stranding at Farewell Spit is the third largest incident in New Zealand’s recorded history. In 1918, 1,000 whales beached themselves on the Chatham Islands, and in 1985, 450 were reportedly stranded at Great Barrier Island off the coast of Auckland. Do ship strikes threaten the recovery of endangered eastern North Pacific blue whales?